* © 1976 Bocu Music Ltd. The hushed audience watches with a single eye, breathes with a single breath. Gradually they join in, and the hall becomes a great echo chamber of song. In just four years, ABBA, the effervescent Swedish group of two young men and two women, has become the hottest act in popular music. At an Oslo performance last year, touts easily sold tickets at several hundred Norwegian crowns apiece. When the group performed at the Albert Hall, London, a week later, the box office was flooded with 50,000 orders for the 11,212 seats. In Australia, crowds queued for two days for an ABBA concert at Sydney's showground. The sheer breadth of their appeal astounds the record industry. ABBA's audiences include all age groups, and they have topped the pop music charts in most countries - including Hungary, Malaysia, Turkey and Taiwan. Their single records 'Dancing Queen' and 'Knowing Me, Knowing You' were both Number One hits in Britain for five weeks, while the Greatest Hits album joined the select group of long-playing records that have chalked up more than two million in sales. Since 1973, the world has bought 50 million ABBA singles and 30 million albums worth some 70 million pounds. The Swedes had now passed even the Beatles in sales. Their names are Agnetha, Bjorn, Benny and Anni-Frid - hence ABBA - and they look as fresh, relaxed and buoyant as they sound. No snarls, no whines, no aggressively sexual pelvic gyrations. They come on straight, in a mixture of assurance and good-natured self-kidding. The Music. ABBA has occasionally been called a rock-and-roll group, because they give a hard-driving beat to some songs. But they have none of the ear numbing, mind-bending rock of the 1960s. In fact, the ABBA style and material are totally eclectic. In a number like 'Nina, Pretty Ballerina', they are a tick-tock polka band; in 'So Long', a powerhouse rock group; in 'People Need Love', a rhythm -and-blues outfit in the spiritual, hand-clapping tradition. More often than not ABBA likes to mix influences - cradle a honky-tonk piano in a mesh of strings, or, in a number like 'Bang-A-Boomerang', lay down a rumba over a basic rock beat. What really sets the group apart is its sound. Partly it is a result of sheer electronic wizardry - a waving together of synthesisers, marimbas, chimes, accordions, electric pianos and guitars, saxophones, violins, drums and an assortment of rhythm instruments to create a distinctly airy, lace-like, far-floating quality. Partly it is the voices, the crystal-clear harmonising. Nobody can float a lyric line with greater sweetness and clarity than the two ABBA women. Says Pepe Domingo Castano, one of Spain's best known disc-jockeys: 'They have the cleanest throats in the business'. Not out to change the world, they sing lyrics almost anybody can understand and respond to. Most typically ABBA try to leave their audience o an upbeat note - 'You can dance, you can jive' - with a feeling they can touch the stars. 'I suppose if there's any message at all' says bearded Benny Andersson, the pianist. 'it's Get Happy'. Benny, 31, is the most experienced of the quartet. A native of Stockholm, he got his first accordion at the age of six. Over the years he taught himself to play every keyboard instrument, then at 18 became organist for the Hep Stars, a new group that became the hit of the 1960s is Sweden when they introduced roaring, American =-style rock. Bjorn Ulvaeus, 33, was a member of another group, singing American folk music and playing the guitar. Agnetha Faltskog, 28, blonde and school-girlish, and dark, sensuous Anni-Frid Lyngstad, 32, both had pre-ABBA careers as popular singers. The Makers. Benny and Bjorn met at a party in 1966 and found they both wanted to write original Swedish hits. In emulation of the Beatles, the two friends started turning out songs that were long on melody and heavy on rhythm. Signing on Anni-Frid and Agnetha (today Bjorn's wife), they made their debut as Festfolk at the Tragarn club in Gothenburg - and got a lukewarm reception. Stig Anderson, a promotional genius in Stockholm who was already Bjorn's' personal agent, took them on in 1971. Journalists started calling them ABBA and the name stuck. Soon they were singing in English, which helped their success on the in recording circuit. At first, Benny and Bjorn did the vocals, the women simply filling on the chorus. But listening to recordings of their songs, they realised that the women's voices were outstanding, and capitalised on the fact. They also listened to a knowledgable 28-year-old sound engineer, Micke Tretow. Tretow had studied American techniques of over-dubbing, which can make a duet sound like a choir. Experimenting, he developed a trick of his own: by reducing a tape recorder's speed a hairline percent during overdubbing he gave a kind of ghostly amplitude to the music. It isn't an echo or anything multiple, he says. It comes across as an enormous sweeping sound. This new technique was used for the first time in a song called 'Ring Ring', with Agnetha and Anni-Frid chiming like a persistent telephone against a thumping rock rhythm. It became an international best seller in 1973. There are critics who find ABBA's music shallow and tinselly - mere soft rock - and think their success cannot last. 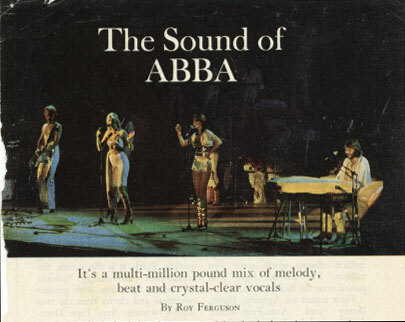 Others believe that ABBA is riding the wave of pop music's future by restoring a strong dose of melody, neglected for years by many leading rock groups. Another reason for success may be the mood they suggest. ABBA's great gift, says Garth Pearce, show-business writer for the Daily Express, had been optimism: at a time when many were getting tired of guttural moans and out unemployment, they have restored joie do vivre to popular music. The group does much of its pre-recording work on the tiny island of Viggso in the Stockholm archipelago. The island, with its dense pine woods and isolated coves and beaches, is an emotional haven and restorative, There, Benny and Bjorn retire every morning to a yellow wooden shack equipped with only a battered upright piano and on old guitar. For hours on end they goad one another on in a kind of musical free association. After perhaps 100 hours they may come up with a tune, and then try to put words to it. In a recording session, Agnetha and Anni-Frid may be on their feet singing for six hours without a break, tracing and retracing the phrases perhaps 50 times over. As in all rock recordings, the music is put together in pieces - vocals one day, instrumentals and electronics n others. At the end, 24 jam-poached tracks on a master tape must be reduced to the ordinary two for home stereo. In this final mixing stage for 'Hole in Your Soul' - one of the songs on a recent album - Benny and Bjorn moved about the studio with the pensive air of chess masters. The song thundered oat ear-splitting volume for two monster speaker boxes. The two men delicately adjusted the levers and dials - some 3,500 in all - on a massive recording console, muttering softly, More trill for the girls, Less boom on the drums, Let's make the bass snap more. When it was over, they were not sure if they liked it. We're never really sure in the studio, Benny said. There are so many variables. Afterwards they walk up the stairs from the basement studio into the sunlight. Bjorn had a cassette recording of the last version they had cut. He pushed it into the tape deck of his parked car and they stood at the kerb listening intently, heads bent, feet lightly tapping, shoulders twisting slightly as the rhythm section laid it down. Anni-Frid smiled. It's starting to sing, she said.